NEW DELHI, April 15-The Finance Minister, Mr Yashwant Sinha, today sought to rest the speculation about the fate of the Union Budget in the present situation of political uncertainty by saying its passage in Parliament would face no problems. NEW DELHI, April 15  The Supreme Court today reserved its verdict on a bunch of special leave petitions challenging the constitutional validity of two notifications issued by the Tamil Nadu Government and one by the Centre on the trial of cases against Jayalalitha. 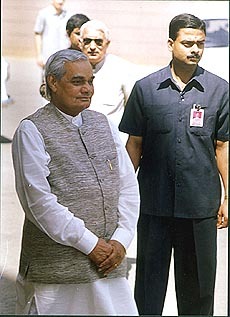 Prime Minister, Mr Atal Behari Vajpayee, arrives at Parliament House on Thursday to move the motion seeking vote of confidence of the Lok Sabha.  Photo by Vijender Tyagi. NEW DELHI, April 15  After having been criticised strongly following the dismissal of Admiral Bhagwat, the BJP-led coalition government has made an attempt to clear itself from all charges made by the former Chief of Naval Staff, Vishnu Bhagwat, in the 130-page booklet prepared by it for circulation among the Members of Parliament. NEW DELHI, April 15  Hundreds of journalists and non-journalists affiliated to seven major trade unions of newspaper and news agency employees today held a protest march to Parliament against the anti-labour attitude of the Indian Newspaper Society and the Manisana Singh Wage Board. Intervening during the discussion in the Lok Sabha on the motion of confidence in the Vajpayee government, the Finance Minister said, "People are expressing concern about the passage of the Budget. But I assure them that the Budget and the Finance Bill will be passed". He defended his economic policies and pointed out that it was through deft handling that the Government had put the economy back on the rails despite the problems it faced. "Despite all problems, this country has been brought back on the rails and it is ready to take off. Let us not do anything for which we may have to repent later," he said while appealing to members to rise above party considerations and support the government. Assailing the Congress for attempting to destabilise the government, Mr Sinha said the main opposition party could not stay away for long from power and, therefore, it had often been indulging in toppling games whenever non-Congress parties were in power." He stated that the Vajpayee Government was the second non-Congress government to complete one year in office and said that the other opposition parties should beware of the designs of the Congress to gain power. NEW DELHI, April 15 (PTI)  The Supreme Court today reserved its verdict on a bunch of special leave petitions challenging the constitutional validity of two notifications issued by the Tamil Nadu Government and one by the Centre on the trial of several corruption cases against AIADMK leader Jayalalitha. A Division Bench comprising Mr Justice G.T. Nanavati and Mr Justice S.P. Kurdukar also reserved its judgement on the SLP by Jayalalitha challenging the constitutional validity of Section 3(1) of the Prevention of Corruption Act under which the state government through two notifications in April, 1997, had set up three special courts to exclusively try cases against her. The Centres notification of February 5, which reallocated cases against Jayalalitha from the three special judges to other judges, was challenged by a consumer activist organisation, Voice, saying it amounted to interference in the powers of the judiciary. Counsel for Jayalalitha, Senior Advocate K.K. Venugopal, while defending the Central Government notification, said the notifications were issued mala fide by the Karunanidhi government to persecute Jayalalitha, who was his political rival. He said Section 3(1) gave arbitrary powers to the state government to pick and choose cases against political rivals and the setting up of three courts to conduct a highly publicised trial was an example of political rivalry being settled through mala fide exercise of powers. Attorney-General Soli J. Sorabjee created a mild flutter yesterday when he said that though the Centre had taken a stand before the apex court that it would exercise its powers under Section 4(2) of the act for the reallocation of cases in consultation with the Madras High Court, "apparently it did not receive any communication from the Chief Justice." The booklet, already circulated among the MPs, besides clarifying various allegations specifically made against the Defence Minister, Mr George Fernandes, also carries annexures of the important decisions taken during the Governments tenure and details of the meetings held between the Defence Minister and the former Chief of Naval Staff. Among other clarifications, one is on the proposal for the building of indigenous Air Defence Ship (ADS) and also on the buying of an Aircraft Carrier, Admiral Gorshkov from Russia. The government says that the ex-Admiral Vishnu Bhagwat was party to negotiations for Admiral Gorshkov and had been consistently pushing the case, the proposal for building of the ADS had been put on the backburner due to a letter written by the former Chief of Air Staff, Air Chief Marshal S.K. Sareen. As a result of the letter from the former CAS, there were querries from the Prime Ministers Office and from the office of the then Cabinet Secretary and the proposal was put in a limbo. The booklet says that it was due to the Defence Ministers initiative, that the proposal shelved for seven years, was resubmitted and finally got cleared from the Ministry of Finance in February, 1999. Although this did not materialise, in November 1997, the then CAS, Air Chief Marshal Sareen wrote a letter arguing that it would be prudent to utilise the limited defence budget to acquire additional squadrons of SU-30 rather than spend money on the ADS. This letter was circulated by the CAS to Cabinet Secretary, Principal Secretary to Prime Minister and Ministry of Finance. On this pretext, the proposal for Air Defence Ship was put into limbo, the booklet says. After he took over as the Defence Minister, he was apprised of the status of ADS by the former Chief of Naval Staff. After considering views of the CNS and the MoD and the objections from the then CAS and the Defence (Finance) wing, he took a decision on June 16, 1998 that the indigenous Air Defence Ship will be manufactured and that a note be sent for approval of CCS. The booklet adds that the Defence Minister took immediate action to obtain relevant inputs from the Naval Headquarters, the MoD and the MoD(Finance) and again decided on September 24, 1998 that Air Force and Navy have their own respective roles to play. It is absolutely essential that the work of Air Defence Ship commences at the very earliest. A proposal be resubmitted to Ministry of Finance for expeditious clearance. NEW DELHI, April 15 (PTI)  Hundreds of journalists and non-journalists affiliated to seven major trade unions of newspaper and news agency employees today held a protest march to Parliament against the anti-labour attitude of the Indian Newspaper Society (INS) and the Manisana Singh Wage Board. Braving the scorching sun, the protesters under the banner of the National Coordination Committee of Newspaper and News Agency Employees Unions (NCCNNEU), marched from Connaught Palace raising slogans against the INS, the wage board and the government. The 500-strong marchers were, however, stopped at Shram Shakti Bhavan, housing the Union Labour Ministry, by policemen. Down with government-INS-board nexus and beware Manisana, dont betray employees, read some of the placards held by the marchers. The workers were addressed by union leaders of news agencies and newspapers, who criticised the anti-labour attitude of the INS and its nexus with the wage board. The NCCNNEU, which has called a nation-wide strike on April 22, threatened to intensify the stir if the wage board did not suitably amend its anti-labour draft proposals. The NCCNNEU comprises the Federation of PTI Employees Unions, the UNI Workers Union, the National Union of Journalists, the All-India Newspaper Employees Federation, the Indian Journalists Union, the Indian Federation of Working Journalists and the National Federation of Newspaper Employees. NEW DELHI: The Delhi High Court on Thursday asked cine star Amitabh Bachchan to file reply within two weeks to a plaint against the Rajiv Gandhi Foundation (RGF) Trust seeking the removal of Sonia Gandhi from its chairpersonship and enquiry into its affairs. Mr Justice S.K. Mahajan issued the direction after Bachchans counsel appeared in the court for the first time since the plaint was filed in August last year. Bachchan is among the eight trustees issued notice by the court in August last year on a plaint filed by advocate P.N. Lekhi levelling various charges against them.